Good news for Hilsa lovers, both in the Northeast and Bangladesh. The production of the most delicious fish Hilsa or Ilish has doubled in the neighbouring country during the last one decade. This was possible because of consorted efforts in successfully implementing ban on catching the fish during the breeding season, according to reports. The report quoted a recent study that stated production of Hilsa fish which was only three lakh metric ton in 2008-09 has been increased to six lakh metric tons last year. The report quoted Asraf Ali Khan Khushru, minister of state for fisheries of the Sheikh Hasina Government while announcing observance of Jhatka Protection Week from March 16 to 22. 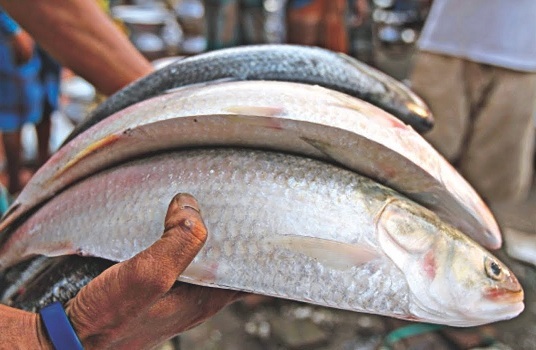 The week will be observed in 36 districts of Bangladesh on the banks of river Meghna and Padma where Hilsa is produced with an aim to create awareness among the people about the necessity refraining from catching fish during the mating and breeding season of the fish. Apart from Bangladesh, Hilsa is produced in 13 other countries but nowhere it is so closely connected with the culture and economy of the country. He said the contribution of Hilsa in the GDP of Bangladesh is one per cent and it has a share of 12 per cent in the total fish business of the country.